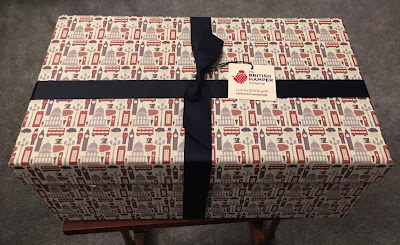 We were very kindly asked to try out a hamper from the family business The British Hamper Company, and they sent through their Divinely Decadent Chocolate Hamper. I have to admit I had been expecting a sort of picnic hamper as a container but it all came packed up in a fabulous box, which was very prettily decorated and wrapped in ribbon. The items inside were well packaged and there was a good selection of goodies inside too. One of my favourite flavour combinations is mint and chocolate. I have to say one of, as there are quite a few things I like. Anyway this was a beautifully old fashioned looking box of peppermint creams from Mr Stanley’s which are covered in dark chocolate. This was the first item I was drawn too, and I can’t wait to try. The next item to catch my eye was the very posh looking Chocca Mocca drinking chocolate. I do love a hot chocolate, at any time of the year, and as this is made with Belgian milk chocolate it should make a lovely soothing drink. Also from the Chocca Mocca brand are some fruits covered in chocolate, there are two bags of these; strawberries in white chocolate and orange in dark chocolate. I think these add to the good range of flavours available in the hamper, and keep it diverse. I’ve tried Willies Cacao chocolate before and it is in the category of superb, but quite pricey. There are two bars from them in this box, a 72% Las Trincheras Gold dark and a Milk of the Gods milk chocolate bar, and they are of fantastic quality and are proper luxury items. Finally we have a bit of fun from Monty Bojangles in the form of some chocolate truffles called Choccy Scoffy, I can’t wait to taste test them. 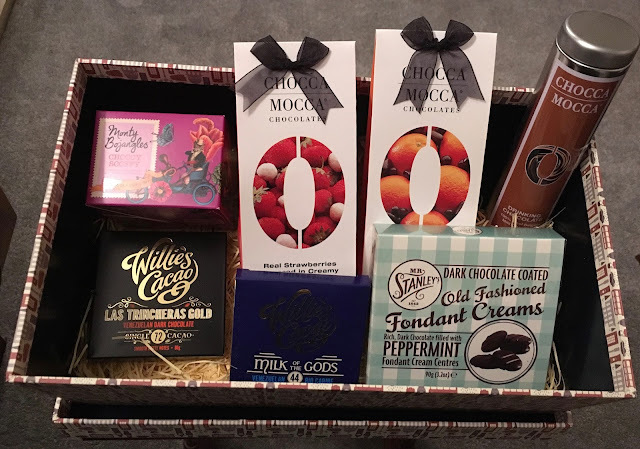 This is a fabulous gift for a chocolate lover, the pleasure is in exploring all the interesting items that are included. I was pleased to see that the makes were all of very good quality, and that there were items for all taste buds. It really is a lot of fun receiving a hamper as a gift, and is guaranteed to put a big smile on any recipients face.